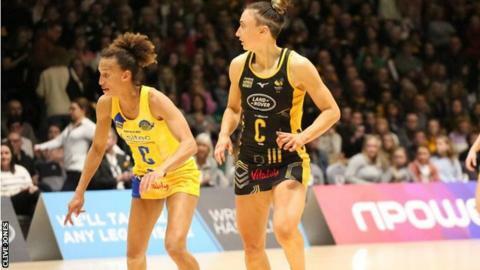 Manchester Thunder remain top of the Superleague table after easily disposing of Celtic Dragons at Belle Vue, while second-placed Wasps saw off third-placed Team Bath. Saracens Mavericks' hopes of breaking into the top four suffered a huge blow when they lost to bottom side London Pulse, who recorded only their second win of the season. Severn Stars made it back-to-back victories for the first time this term as they beat Strathclyde Sirens in Gloucester. Thunder remain three points clear at the top of the table but now also have a goal difference that is 12 better than their nearest rivals following a convincing win. "I'm happy with the result and while we were still a little off a complete performance we brought a much better intensity and purpose to our game that was a little lacking from our round-12 game," Thunder coach Karen Greig said. "Things are tight at the top of the table. Goal difference could prove vital." Wasps remain their closest rivals, and after beating Team Bath, coach Mel Mansfield said: "That was potentially our best performance over the full 60 minutes against really strong opposition." Loughborough Lightning missed the chance to go third in the table as they were unable to recover from Surrey Storm's strong first-half performance. The visitors led by 10 at half-time and South Africa goal shooter Sigi Burger's player-of-the match form played a pivotal part in their fifth win of the season. Despite an impressive second-half fightback it was not enough to prevent Sara Bayman's side suffering their first loss in eight games. Pulse's victory over Mavericks was even more remarkable considering the London outfit lost the reverse fixture 65-37. Te Aroha Keenan's Pulse side, who are in their inaugural season in the sport's top-flight, overcame a wobble in the second quarter to edge ahead in the second half at the Copper Box in London. They welcomed back captain Ama Agbeze to shore up their defence - the England skipper had been absent because of illness - while New Zealand shooter Chiara Semple was in fine form at the other end. Mavericks' week had already started with disappointment, as centre Gabby Marshall was ruled out for the rest of the season following the recurrence of an ankle injury. The Purple and Blacks were off-colour in attack and an error-strewn second half cost them the three points, subjecting them to their second loss in a week. Since England won Commonwealth gold in April 2018, Eboni Usoro-Brown has experienced many memorable moments - primarily getting married and, with her team-mates, picking up two BBC Sports Personality Awards. To mark a year since the Gold Coast tournament started, the Team Bath defender tweeted: "Crazy to think of the year we've had since the opening ceremony. This moment was so special. Such a privilege to be a part of Team England." A specialist running and fitness store is stocking netball kit, including trainers, in anticipation of this summer's World Cup in Liverpool. BBC Radio 5 Live assistant editor Angela Clarke spotted the kit on display in Manchester city centre. She said: "As a netballer, I like to have the right trainers, it's important. "There was also a notice on it saying how 70% of the millions playing the sport in the UK don't wear the right footwear. "But I don't think I've ever seen netball trainers on sale in a UK sports store before. The store assistant said it was because of the buzz of the World Cup."